Imam Mosque (also known as Shah-Mosque or Abbasi Mosque) is one of the most beautiful Islamic buildings in Iran and in the world which was built by Shah Abbas I in 1611. Imam Mosque‘s primary function was a counterpoint to the Qeysarieh portal (the entrance of Traditional Bazar). It is built in a 4 iwans style. 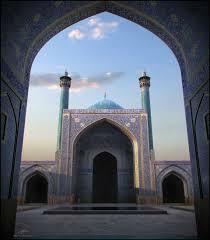 Its entrance iwan with two superb minarets is one of the most magnificent iwans in Iran. Each iwan leads to a sanctuary. The main sanctuary is in the southern iwan with a double layering domed ceiling, 52m. exterior height. 17 The whole mosque is decorated with calligraphy tiles and colorful and Mo‘arragh tiles and mosaics, the best art works of the artists of the time.